Wells Fargo Express, Vol 1 – The Desperate Road | Narration by George! 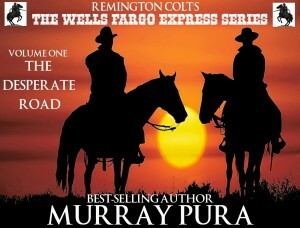 The Wells Fargo Express Series opens with The Desperate Road. Wells Fargo agents Remington Holt and his assistant Amos Drewery do not expect to be robbed by the infamous Pittman Gang when they are on a stagecoach run between Kansas City and St. Louis. Nor does Remington expect to fall for the most beautiful woman he’s ever met on that same stagecoach. But one thing leads to another and before long, what with gun battles with outlaws, romancing a beautiful lady, and dealing with a conspiracy to overthrow the government of the United States, Remington and Amos have a lot more on their hands than they bargained for. Soon it becomes a question of whether or not either of them can get out of the trouble they’re in alive. Available from Helping Hands Press.